After graduation, Casey is planning to study Political Science at the the University of South Carolina. Casey said that ever since the 2008 Presidential Election, he has been into politics. “It just kind of clicked, and I just started looking at it more and studying it more and really getting into it—really no idea why, it just kept building and building,” he said. He said his favorite class is English, because he really likes Mr. Cunningham. Casey said that he used to play the trumpet. “I liked it, but life kind of got in the way,” he said. He is a member of the Stage Crew. 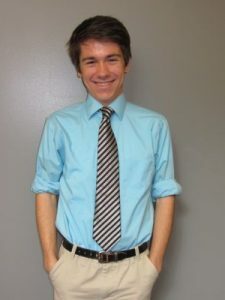 “I am a member of the Key Club, and I also do a lot of work on the Student Council,” he said. Outside of school, Casey said he is a member of the Board of Directors for CAP-21 and also a newspaper columnist. His hobbies consist of writing and watching elections. Casey said whatever little spare time he has, he likes to hang out with his friends, ski and hike. He said enjoys music but doesn’t have a favorite genre—he likes them all the same. “I know that sounds like such a politician’s answer,” he said. His parents are Kelly and the late Chuck Hamlin. Kelly is a registered dietitian for the New York State Persons with Developmental Disabilities. Casey has one twin brother, Sean, an older brother David and three older sisters, Karen, Kristen and Rebecca. During the summer, he earns money working as a parking lot attendant at Enchanted Forest Water Safari. Casey said that Barack Obama is his biggest influence. “Seeing how such a young person could rise up to the top so quickly, how he captivated America, kept their attention and was able to inspire people… Now he is working as hard as he can to do things for the American people—that’s really incredible to me,” he said. He said that he has four cats that he will miss when he goes away to college. “I will miss how laid back Old Forge has been. And being able to hang out with my friends all weekend. We can just kind of mosey around and not have a lot to worry about; and being able to keep the front door unlocked,” he said. Casey said that less than a week after graduation, his family and he are heading to Europe for a few weeks to tour some countries. Then he will come back and help the family move out of their house in Old Forge. “I am looking forward to graduation because I’m looking forward to the next new adventure that lies ahead. I can’t wait to see what else is out there,” he said. Written by: Gina Greco on April 21, 2016.